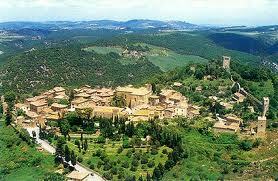 Monticchiello is a suggestively untouched hamlet in the heart of Val d’ Orcia. The typical Tuscan landscape made up of hills and cypresses conjures up the backdrop of the Renaissance paintings. The visitor is going to be highly impressed by this dramatic panorama, especially in this season when the yellow and the green are closely intertwined in the harmonious combination of its medieval architecture. Here Tuscany Holiday Rent offers its best accommodations in Siena for Tuscany lovers and for the visitors who are, as well, willing to profit from the various cultural events. 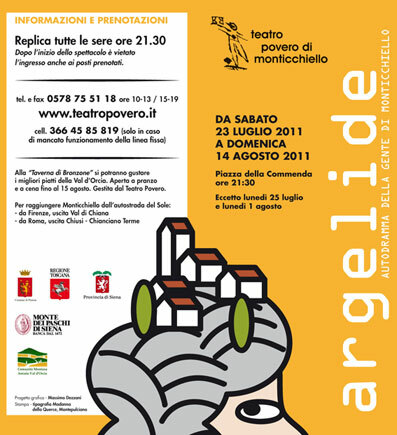 Monticchiello, famous for its Teatro Povero is now staging “Argelide”, a midsummer’s night play, from July the 23th up to August the 14th 2011. As usual since 1967, the 300 inhabitants of the stunning medieval hamlet of Val d’Orcia, are turning into organizers or actors to perform this autodramma – as Strehler defined it – they themselves conceived .The stage is not in an ordinary theatre , it is performed outdoor in Piazza della Commedia. A unique phenomenon in the Italian culture, enjoyed by an audience of 6,000 people, some even coming from various foreign countries. The main square becomes then a large stage surrounded by red geranium decorated windows, structurally reminding us, in a way, the shape of the medieval English innyards used as playhouses. A popular and unconventional theatre where the non- professional actors are directed by a member of the community itself Andrea Cresti . The Teatro Povero declares in its own name the spirit of its staging, it is poor because deprived of the ordinary economical strength, of professionally trained actors but basically because deeply rooted in an unindustrialized social background . This special event, faithful to its community’s lifestyle, has made of acting a way of thinking over and possibly overcoming basic social issues such as depopulation, isolation and social breakdown, an obliged way to reflect on the history, traditions and social commitment of the village. A medium of getting to a deeper awareness, particularly heartfelt, because the whole staff emotionally and intellectually share the very same issues in an ongoing, never-ending process , far beyond the entertaining features of its very beginning in the late sixties. 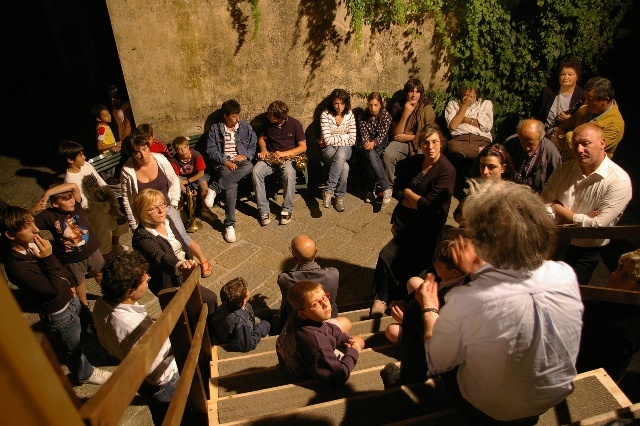 Historically the Teatro Povero has gradually staged the cultural heritage of the hamlet to enlighten the contemporary social identity in order to get to its critical re-assessment, thus reinforcing the original roots. In this sense the key character of the play now staged , the old woman, named Argelide, becomes the symbol of the community. This offspring of a peasant family , proudly grounded in her heritage is the prototype of the past courageous generations . Now in spite of the infirmities of old age, of her aches and pains, Argelide is able to urge the people at her bedside to react against the pressures of morally and economically disruptive times. A reflection on younger generations’ problems fighting for a more respectable future against contemporary uncertainty and unemployment .Then the overcome conflicting tension between the generations becomes here a resource for a new balance. The values of the old enrich and enlarge the perspective of the young, able to keep tight to them against selfishness and astuteness, so prevailing nowadays. Thanks to the director Andrea Cresti and to the inhabitants of Montichiello as well.